Officer Keddy was born on May 19, 1941, in Lynn, Massachusetts and grew up in Danvers, Massachusetts graduating from Danvers High School. He served his country in the United States Air Force at NORAD headquarters. After completing his active service, he served 24 years in the Air National Guard. He was a part-time police officer with the East Kingston Police Department where he helped establish the D.A.R.E. program. He was well liked and known to many in town as “Uncle Mel” and “Officer Friendly.” He also worked part-time for the Rockingham County Sheriff’s Office. He was Director of Emergency Management for East Kingston and a member of the East Kingston Planning Board. 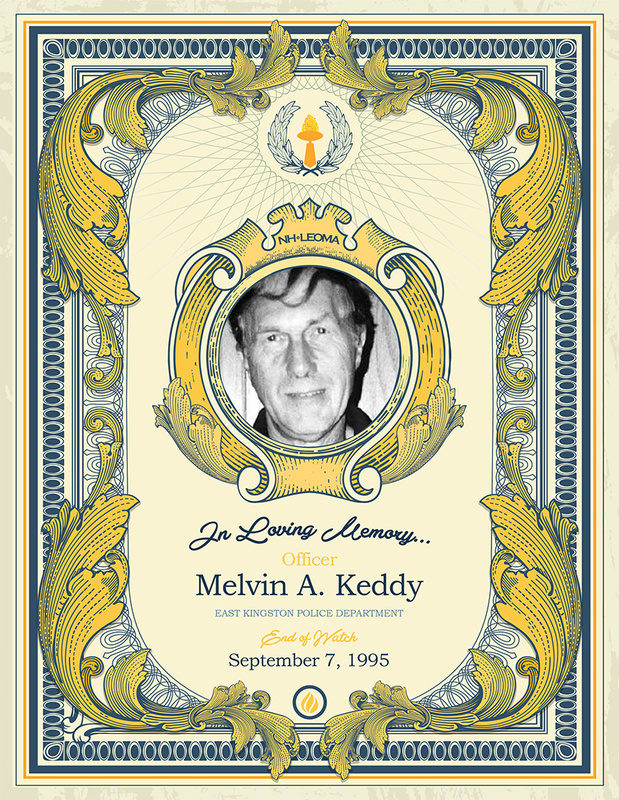 On September 7, 1995, Officer Keddy was struck and killed by a drunk driver as he assisted in diverting traffic around an automobile accident on Route 125 in Kingston. He was 44 years old. He is survived by his wife, Bonnie, and their two children Shayne and Shyre Lyn.